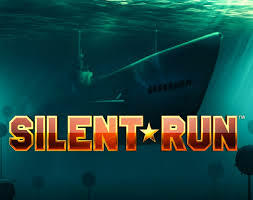 Silent Run by Net Entertainment is an exciting slot game based on battles at sea during World War II. In the game Silent Run, you are inside a submarine, and in the bonus game you are even firing torpedoes at passing battleships. Anyone interested in ships or the history of warfare, will enjoy the colourful underwater atmosphere and smooth game play of Silent Run. The design of the 3D symbols reflects all the ships that take part in battles at sea. The highest paying symbols are all the implements of ocean going warfare, with a submarine, a battleship, torpedoes and mines and depth charges. The symbols with the lowest value are the classic playing cards, from Ten to the Ace. The sound effects in Silent Run include the sounds of a torpedo being fired under water. The Wild in the game Silent Run is the red Warning Light, and this can substitute for any other symbol in the game to form a winning combination, except for the Echo Bonus symbol. There is also a Sonar Wild, which looks like a Radar screen with a red backlight. The Echo Bonus symbol actually looks very similar, but has a green light instead of a red. The Sonar Wild has an interesting effect on the game, as it sends out three sonar signals to let you know where other Wilds are hidden across the reels and columns, and will turn the regular icons on the reels into Wilds. Silent Run slot is by Net Entertainment has five reels, three rows and twenty five pay lines for NZ betting. The number of wins lines is not adjustable, you will always play with twenty five pay lines. There is a control button, meaning you can adjust both the value of the coin bet you wish to place, and the bet level. The centre button will start and stop the spins. There is no free spins round in Silent Run, and instead of a Scatter symbol there is the green Sonar Screen symbol which sends out a sonar signal to discover where the torpedoes are hidden on the reels. You will need to land this symbol anywhere on the middle reel to start this bonus round in Silent Run. You will be taken to the start of the Echo Bonus game, and the Sonar will search out the different symbols to find torpedoes, and each beam can get you five torpedoes. You will then be able to shoot torpedoes at battleships and blow them up. How much you score depends on the number of torpedoes the signal revealed, and the value that each type of ship has that you have sunk. Each ship you sink has a different value. Every torpedo adds a multiplier to the points you get for hitting a ship. The multiplier increases after every hit until your torpedoes have run out. One torpedo will get you a multiplier of one, two will earn a multiplier of two. It will increase by one each time until you get to five torpedoes, and then your multiplier will be increase to ten. NetEnt always offers players a top quality online slot game, with clearly marked pay lines and bets per line. Whether playing at the lowest limit or highest bet, Silent Run offers an exciting experience for all players.